The Doctor, Romana, and K-9 are hoping for a holiday in London in the sweltering summer of 1930. But the TARDIS is warning of time pollution. And that's not the only problem. What connects the isolated Sussex resort of Nutchurch with the secret society run by the eccentric Percy Closed? Why has millionaire Hepworth Stackhouse dismissed his staff and hired assassin Julia Orlostro? And what is the truth behind the infernal vapour known only as Zodaal? With the heat building, the Doctor and his friends set out to solve the mysteries. 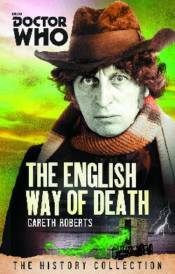 An adventure set in 1930s London, featuring the Fourth Doctor as played by Tom Baker and his companions Romana and K-9.